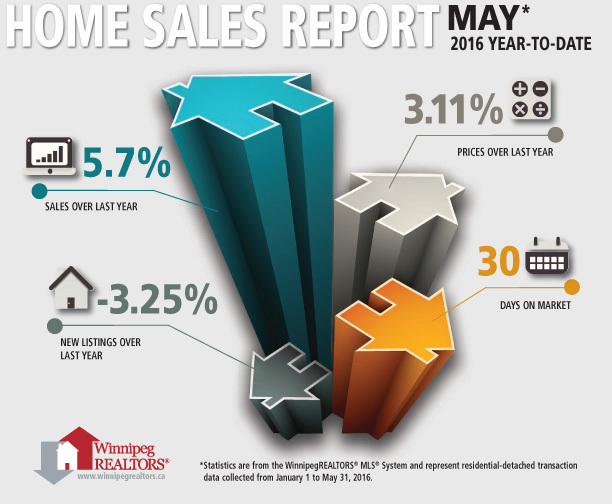 WINNIPEG – May 2016 showed stellar results with MLS® sales surpassing 1,600 for only the third time in WinnipegREALTORS® 113-year history. MLS® dollar volume followed suit with a new all-time monthly record of $460 million. 2016 is picking up where 2015 left off with a full recovery in condominium sales from early last year and residential-detached sales continuing to shine and show gains over the previous year. Beyond the two main property types, sales increases are also occurring in most others such as duplexes, vacant land, commercial, mobile homes, single-attached and town houses. 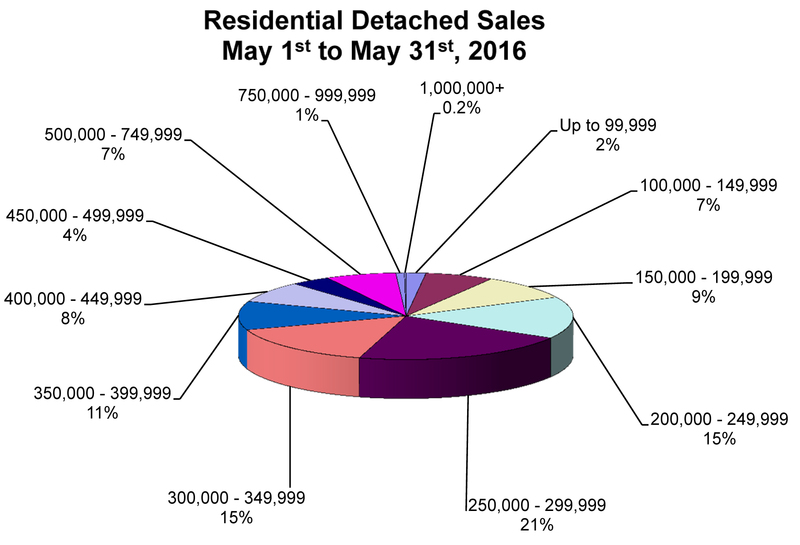 Only May 2007 has higher monthly sales than the 1,629 sales transacted in May 2016. Both May 2016 sales and dollar volume were up 12% over May 2015. New listings were robust too, just shy of 3,000 coming on to the market in May. Despite all these new listings, the inventory of 5,291 listings at the end of May is down 8% from last year. Year-to-date MLS® sales of 5,446 are up 9% from the same period last year and ahead of previous years, albeit by a very small margin in comparison to 2012. Year-to-date dollar volume of $1.5 billion is up 10% from the first 5 months in 2015. Listings entered on the MLS® in 2016 are virtually the same as last year’s at just over 11,000. Sometimes it is interesting to note where your gains are in sales over the previous year when you look at the price range breakdown. May 2016 saw quite a significant increase in residential-detached sales at the lower end of the spectrum from $125,000 to $149,999 but also experienced a sizable jump in sales activity from $475,000 to $599,999. As for condominiums, an upward shift is occurring with the $200,000 to $249,999 price range showing a 33% increase in unit sales over May 2015. You only have to go back to May 2013 when the $150,000 to $199,999 price range for condominiums was so much more dominant than other price ranges at 40% of all sales. May 2016 shows the $200,000 to $249,999 price range coming within a few sales of equaling this price range. The most active price range for residential-detached sales in May 2016 was from $250,000 to $299,999 at 21% of total sales. Deadlocked in second place were the $200,000 to $249,999 and the $300,000 to $349,999 price ranges at 15% each. The highest sale price was $1,650,000 with the lowest at $37,000. The average number of days to sell a home in May was 23, 2 days quicker than May 2015. The most active price range for condominiums in May 2016 was $150,000 to $199,999 (at 24%). Close behind was the $200,000 to $249,999 price range at 22% of all condo sales. The highest condominium sale price was $460,950. The lowest sale price was $84,500. The average days on market for condo sales in May was 47, 6 days slower than May 2015.